Did John Calvin’s Institutes of the Christian Religion make your 2010 reading list? I encourage you to partake in a one year journey through the Institutes. You will not be alone, Bound With Christ is a new blog which provides a reading schedule and a place to discuss the reading. Once you make the commitment to read through the Institutes, you need to pick up a copy. You can buy a paper copy, read it on the Christian Classics Ethereal Library for free, or download it as a PDF. I will be reading using my eBook software. Specifically, I will be reading in the new WORDSearch 9. WORDsearch provides over 200 free books, and the Institutes of the Christian Religion is one of them. You can either read it for free using the free eBook software Bible Explorer 4, or you can use the more powerful WORDSearch 9 software. WORDsearch 9 packages start at $49.95 for the Thompson Bible Library and goes up to $349.95 for the Preaching Library. I purchased WORDSearch 8, but was provided a complementary upgrade to WORDSearch 9 for the purpose of blogging about it. 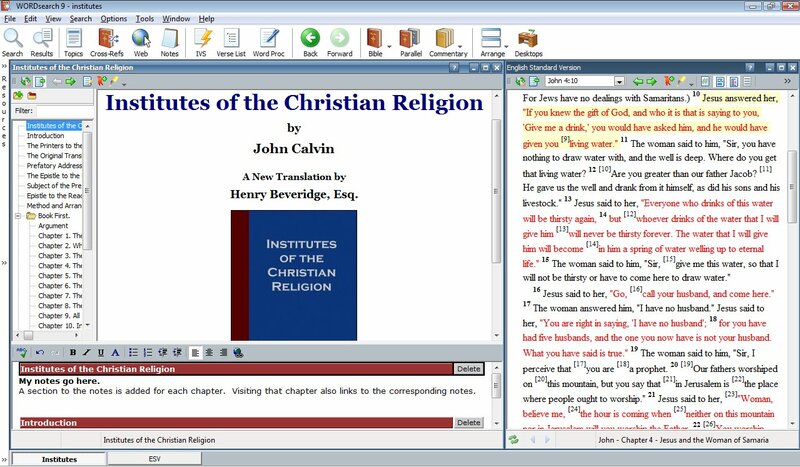 For the purpose of reading the Institutes alone, you will do just fine with the free Bible Explorer 4 software. All of the features I use in this post are available in Bible Explorer. WORDSearch 9 allows for custom desktops, which are really just saved window arrangements. I have several setup and have found setting up the perfect desktop for the task is really the key to being productive in WORDSearch.. For example I have a desktop setup for commentary reading. In one corner is the cross reference explorer, in another corner are all my Bible translations, then taking up half the screen are my favorite commentaries. In the same way, I have created myself an Institutes desktop. I have 2/3rds of the screen dedicated to the Institutes, the other 1/3rd I have open the ESV Bible. I also have my person notes open, just under the Institutes and the rest of my library hidden. A couple of quirks to note, the desktop does not save perfectly, the screen split resets to 50/50 and the personal notes are hidden when you exit WORDSearch. So, why is this better than reading it on a website or a PDF? Linked Bible. Just hover your mouse over a scripture reference to read that verse. Click it to have your Bible window jump to that verse. Notes. Taking notes in a PDF is not ideal. I’ve used PDFs as ebooks before and it is quite cumbersome. Taking notes on a website is even harder, although possible with services like sidewiki. Highlighting. Several colors are available, quick and easy to apply. Bookmarks. Easy to place, easy to jump to. Navigation. The table of contents makes for easy navigation and can stay open on the left or can easily be hidden. Previous post: Let Jesus into your heart!